From Huntington Beach California USA. Their name has been an icon in the skateboarding industry ever since somebody decided to stick four wheels to a piece of wood. Since then, Madrid Pro Designs has developed into one of the top leading deck manufacturers in the world. 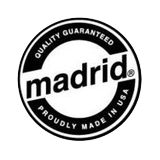 Madrid Pro Designs still uses our traditional recipe for making skateboards, with a few modern improvements here and there.